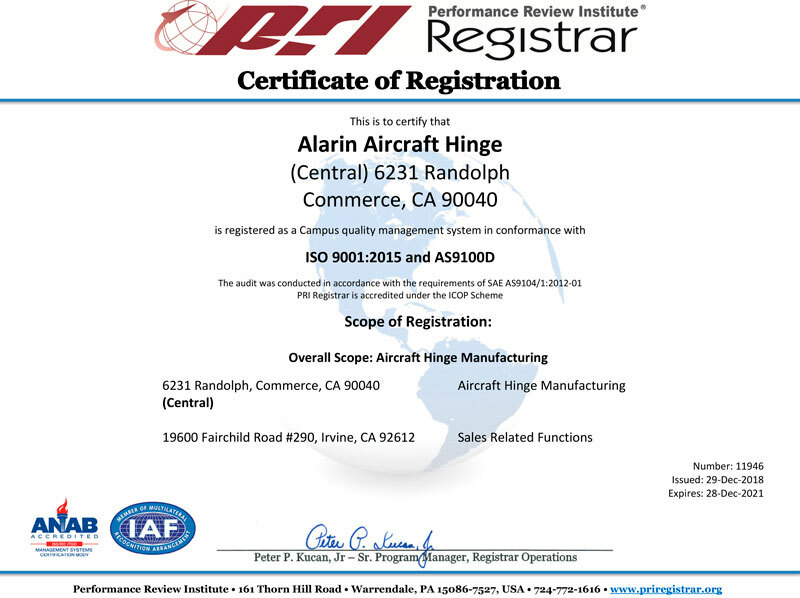 Alarin Aircraft Hinge's Quality Management System is certified by Performance Review Institute Registrar ("PRI") as AS9100 Rev. D and ISO 9001:2015. 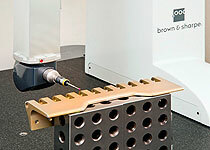 ▶ ALARIN will strive to deliver product and value to meet or exceed the customer's requirements. ▶ ALARIN shall commit to comply with all applicable requirements and to continuously pursue improvement through training its people, upgrading its equipment and employing lean practices. ▶ ALARIN will monitor, measure and analyze its processes for continuous improvement of its Management System throughout each year. Management will review all monitoring data during its Management Review for continuing stability and effectiveness of the Quality Management System. ▶ ALARIN's established Quality Policy shall be carried out an implemented at all levels within the organization. All Alarin training will begin with a review of the Quality Policy. The employees of Alarin Aircraft Hinge are committed to meeting or exceeding our customers' expectations by implementing continuous improvement in our processes and procedures. All Quality Management employees are extensively trained in ISO9001 and AS9100 standards, reading engineering drawings and tolerances and the use of precision inspection equipment for customer specifications. 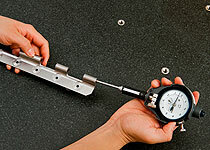 Alarin's Quality Management team has the most accurate tools in-house and uses these tools to verify conformity to customer requirements for all parts. 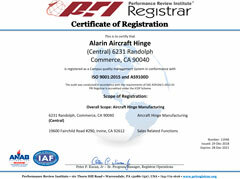 Alarin Aircraft Hinge is in compliance with all ITAR, DFAR and EAR requirements. All special processing called for by customer specifications, including heat-treat, CAD plating, anodizing, paint and passivation, are outsourced to customer approved sources who are also approved suppliers to Alarin Aircraft Hinge. Alarin has long-standing relationships with the leading outside processing providers ensuring timely turn-around and competitive pricing. The Boeing Performance Excellence Award is an annual program for Boeing to recognize superior performance as measured by composite performance ratings and minimum levels of contract value and deliveries. 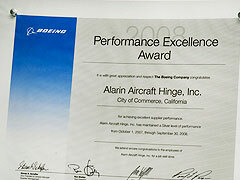 In 2008, Alarin was awarded the BPEA (Silver) for its outstanding performance and service to Boeing.